Is it possible to go back to the old app? I don't like this new app. I can't see the results while I am playing. I don't like clicking on history, because then I can't see the cards. I want to be able to see the results next to the cards in play as before in the old app. I also want to be able to see what the other tables did on each board. I don't think this is an improvement at all. What is the point of the new app when it has fewer features than the old app? IWhat is the point of the new app when it has fewer features than the old app? Switching from obsolete Flash to modern HTML5. * being able to see the scores of the hands played without having to open a new window that obscures the playing area? * being able to see the scores of all other pairs that have played the same hand? Also - I find the responsiveness of clicking on the cards to play them on this app is really awful. Sometimes I can't get the card I want to play to move, so I have to choose a different one - that is stupid. I am using a Samsung Android tablet. I use the app on my tablet when I am at the gym on the treadmill. I used to play about 3 robot tournaments during my workout. When I tried it on Monday, playing one tournament on the new app was so painful that I didn't try to play any others. I will have to find something other than BBO to entertain me while I'm on the treadmill, which is not what I prefer. 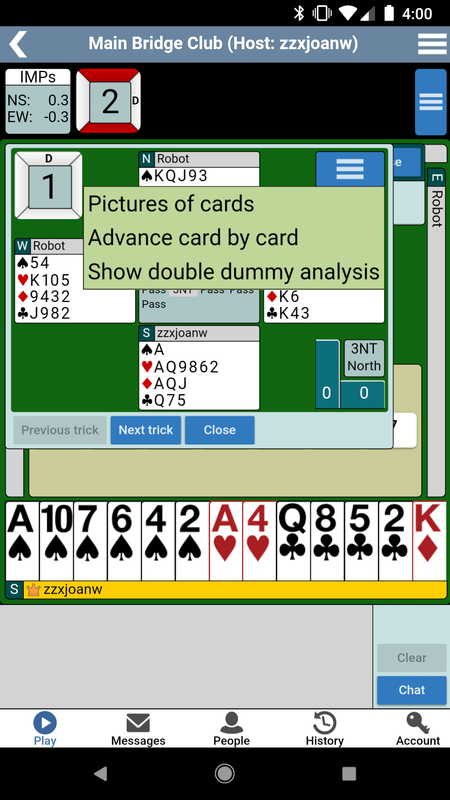 In recent tourneys my partner played with the app, and it looked like her explanations attached to a call were not shown to anybody but to herself. First I suspected some handling error, but tonight I tested this with a teaching table. It turned out that explanations that were typed in before making the call were ok. But explanations entered after the call are indeed not transmitted. I find it strange that this was not yet reported by someone else. You can only play 3 free daylongs a week, it doesn't matter which client you use. Please post here feedback, comments, suggestions, bug reports. Why doesn't the Android app have an easy way to see the results at other tables? I second this. I use those other table stats to learn; so, i am really missing thks feature on the new app. You can find them in the History tab. The "app back" chevron (top left) acts as you would expect: it goes back within BBO. However, the "system back" button (on most phones bottom left) acts as a "exit" button for the app. This is contrary to how most Android apps work, e.g. web browsers when the system back button is back in the browser. It is pretty natural for Android users to use the system back button and expect to stay within the app - there are two other system buttons to get out of an app, why include a third? Introducing extra clicks for such a commonly-used feature seems a step backwards to me. The old app did not have his merry-go-round of clicks to see the other tables. Actually it is the same number of clicks as before (or 1 click fewer if you used "Show Results" then "Show Details" to see other table results with the old version). Also in the new software there is much more you can do/see in terms of results without leaving the table-screen (especially for team matches and vugraph where you can see the other table results without leaving the table-screen). But I agree there is something awkward about how the History area works. I am sure we will try to improve things in future updates. Thanks for your patience. High and been using iPad for a while. Finally found "other tables" on my own. I am having trouble running the app on Wi-Fi. I can't get on unless I shut off the Wi-Fi but that eats a ton of data. Any thoughts or suggestions? Does this happen at different hotspots? Have you tried running a speed test on your WiFi to make sure it's working well? The new app for Android is a MAJOR step backward. Awful. It would be an improvement to have names that include diacritics displayed correctly instead of having non-English characters replaced by the hexagonal ? sign. The one thing that winds me up, is the use of back button at the bottom right of my Samsung screen. In most apps it works as a back button within the app, but if I use it in the BBO app it closes the app. and accidentally closing the BBO app is annoying?